If you have a small bathroom, you will most likely experience issues when it comes to storage. When space comes at a premium, it’s more difficult to place shelves and incorporate storage solutions without making the entire area feel cluttered. 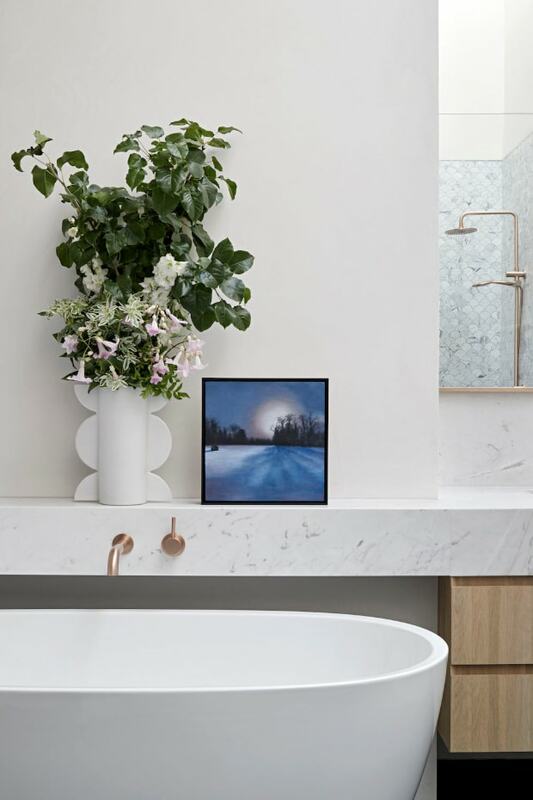 To create both a stylish and organized small bathroom, you need to try out some smart shelf ideas to enable you to store all your essentials more efficiently and also obtain some space for displaying decorations. Check out the following ideas that will help you to maintain an organized and serene bathroom. 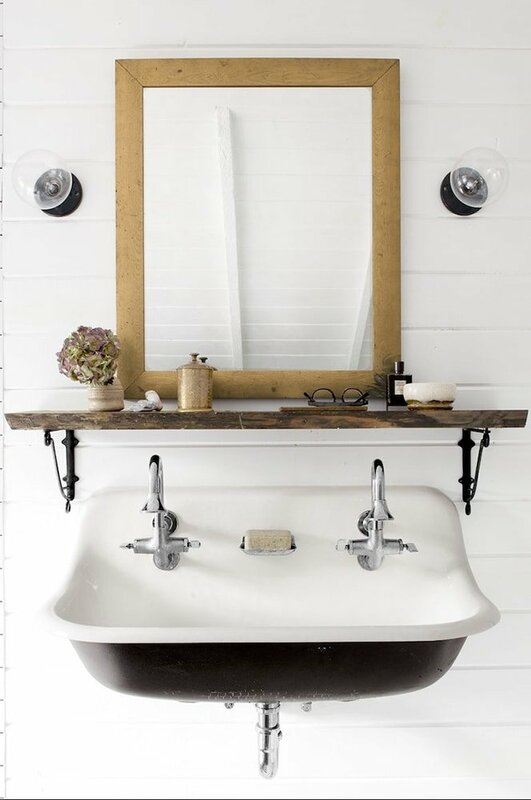 A small bathroom can look more chic when you add a floating shelf right above the sink. This storage spot could be an excellent place for various small items including a few decorative elements. Those who lack a hidden cabinet will probably like this idea the most. 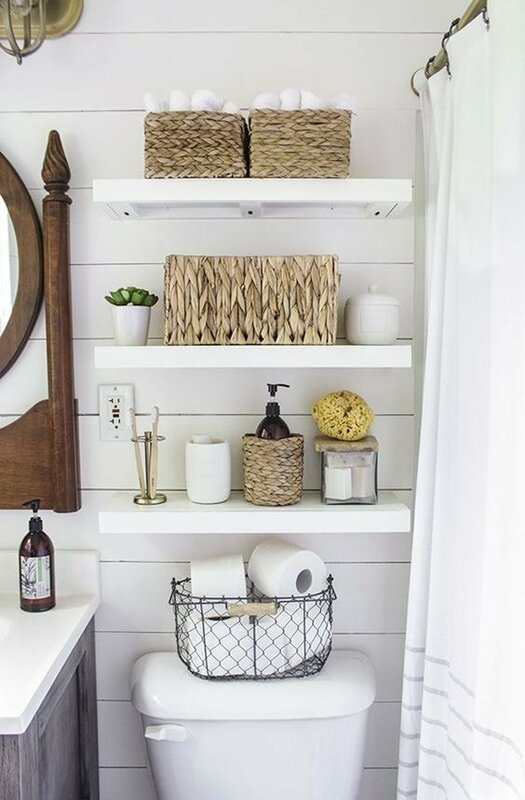 Floating shelves, in general, are great storage solutions that you shouldn’t overlook if you’re trying to manage the available space in a small bathroom as efficiently as possible. Check out these rustic floating shelves from Amazon. They’re very practical to use and easy to install on any wall in the bathroom. If store-bought shelves don’t match your desired look, perhaps you should turn to DIY projects. 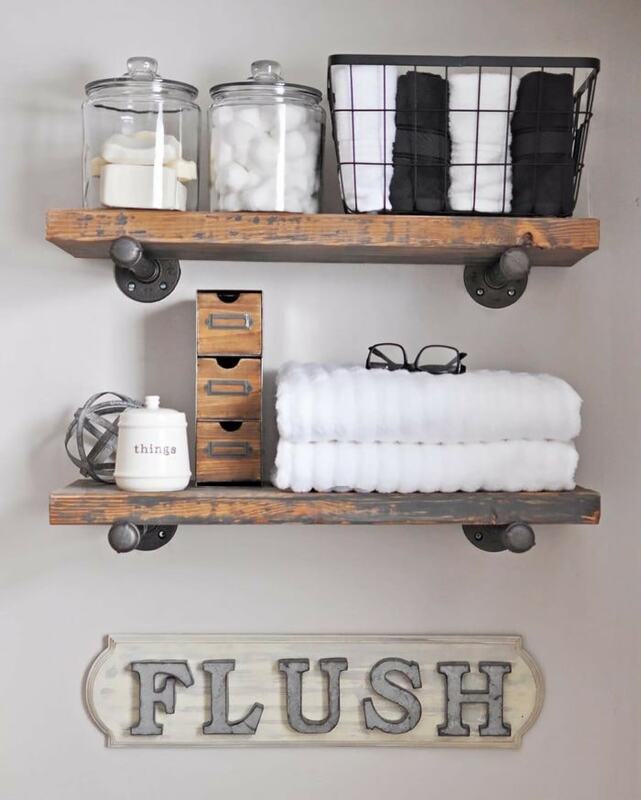 Here’s a good example as these pipe shelves give off a strong industrial vibe which could be perfect to match the rest of the décor in your small bathroom. With a bit of creativity, it’s possible to create a one-of-a-kind look. The main elements here are the black iron pipes that aren’t expensive yet they can provide an impressive visual effect when paired with the rustic wood of the shelves. If you manage to integrate reclaimed wood, you can save even more on the costs. 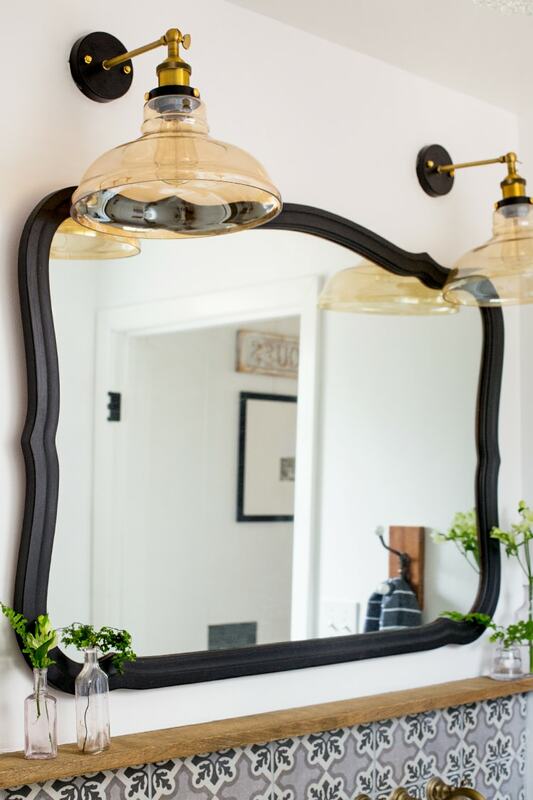 To mimic the industrial design shown here, check out the tutorial of this DIY project. 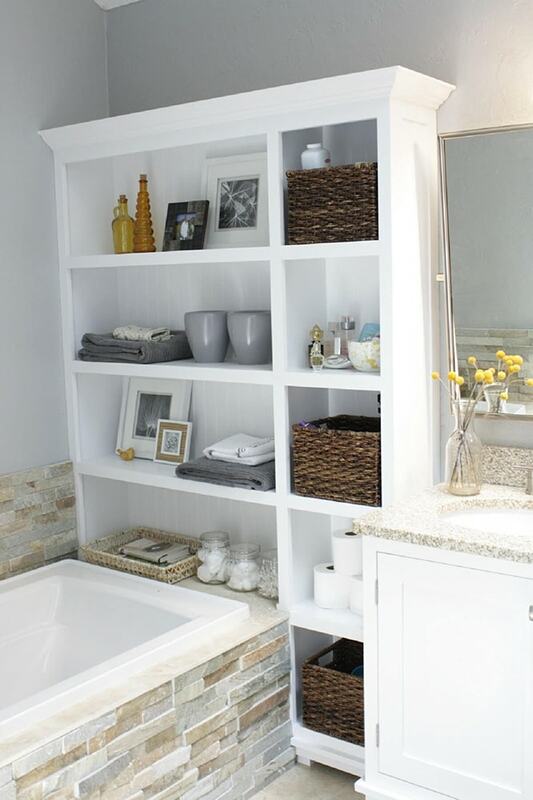 One solid remodeling idea for any small bathroom is to incorporate a built-in shelf. 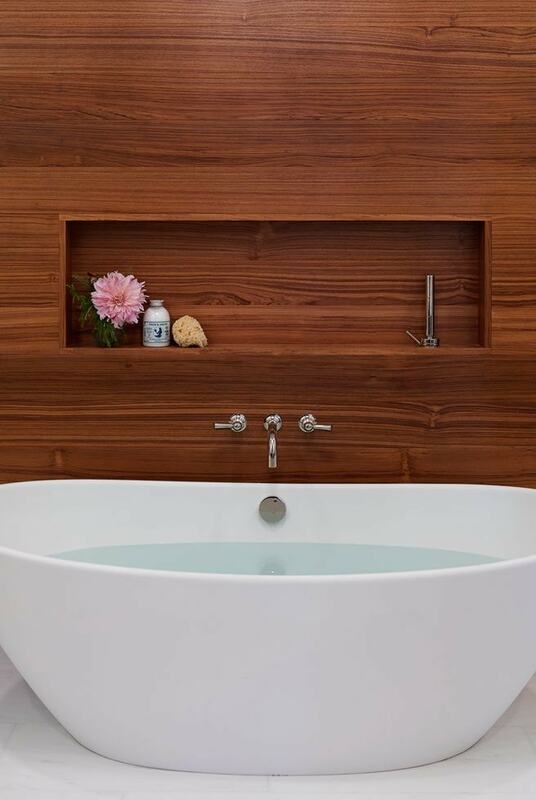 This could be very useful if you own a freestanding bathtub. You can enhance the illusion of space by blending in the shelf with the surrounding wall. In this example, the shelf looks superb as the wall is built using the same material. It’s not easy to achieve this kind of organic look that cleverly utilizes clean lines. The resulting effect takes your mind to minimalist design due to how the nook in the wall is subtle and very elegantly integrated. Ladders are both stylish and practical as you can use them to display decorations as well as for storing bathroom essentials. 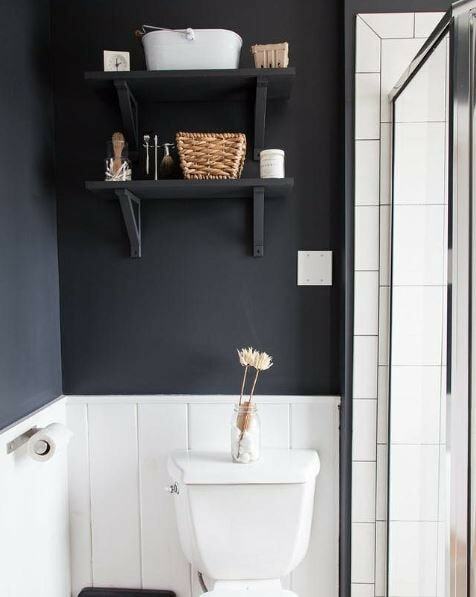 A clever way to make better use of the space above the toilet is by adding a nice ladder that’s been modified to accommodate decorations and other items more easily. 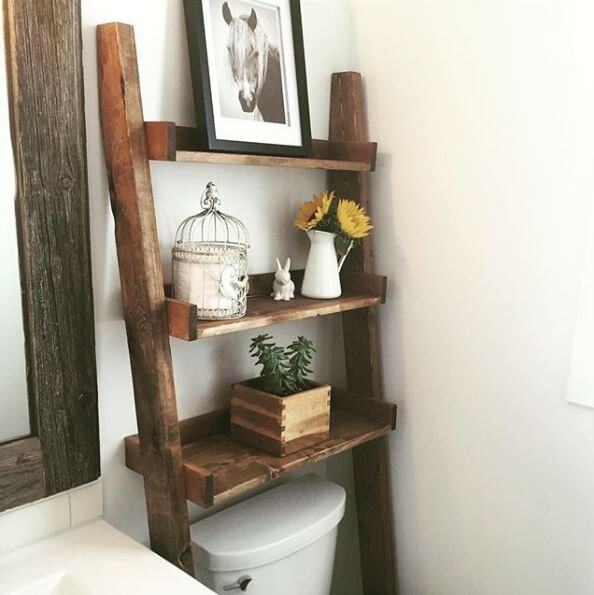 If you’re going for a rustic look, this kind of vintage ladder can work like a charm for a small bathroom. This is a creative and very attractive shelf idea that shouldn’t be missed if you want to add some personality to this functional room. 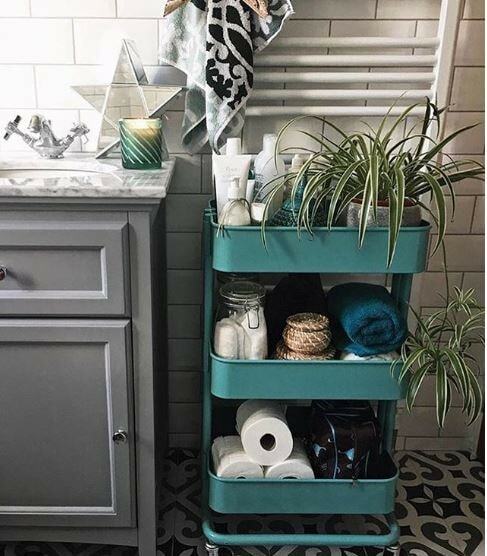 With the help of a RASKOG utility cart from IKEA, you will be able to create a mobile shelving unit that can be filled with all the necessary supplies of a small bathroom. The greatest advantage of this kind of cart is that it’s equipped with wheels for enhanced mobility. If it feels too bulky in a particular corner of the bathroom, you can just move it to a different spot with ease. It also facilitates the cleaning process as you can get it out of the way more conveniently. The colorful modern design of this rolling cart makes it a suitable choice for bringing in some style to the bathroom. When you run out of space, one simple solution is to take a vertical approach. You might often discover that you can make use of higher spaces in the room. This small bathroom has been equipped with a simple shelf above the door which takes advantage of this idea. It’s not exactly the best spot to store frequently used items, but for lesser-used supplies, this high shelf could work very well. Placing a shelf above the door represents a smart solution to avoid cluttering the bathroom area. Those who want to focus on efficient storage in the bathroom should check out these practical floor-to-ceiling cubbies. They have great organizational potential and offer enough space to place everything from toilet paper to towels, and other bulky items. 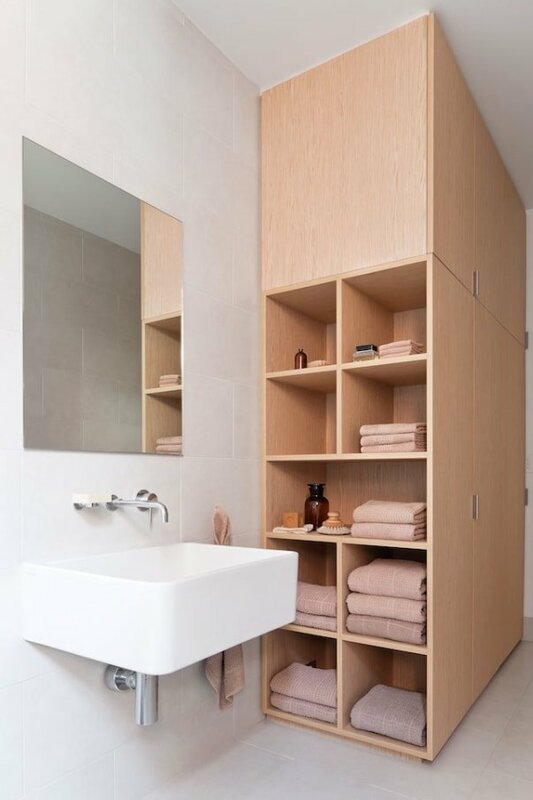 In this example, extra attention went into design details as evidenced by the way the neutral-toned towels blend with the wood style of the storage unit. 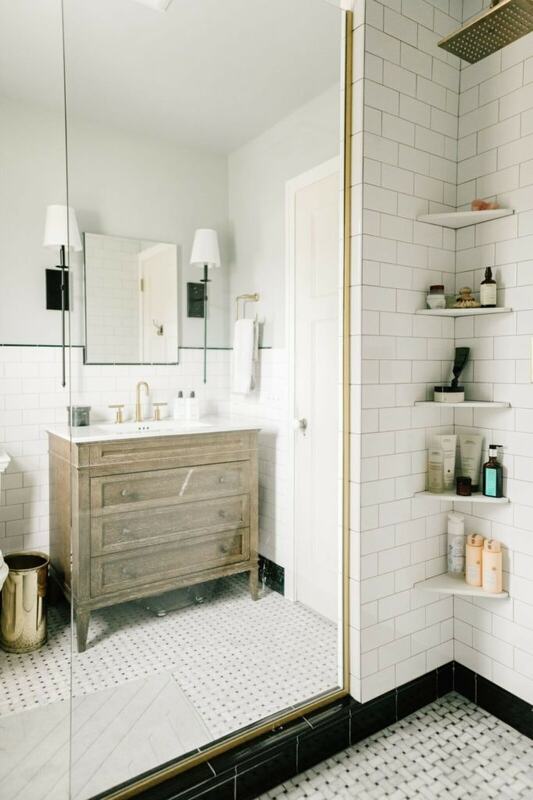 There are times when you need some extra storage space in the bathroom, while sometimes you just want to keep the area as uncluttered as possible. In that case, we recommend implementing a folding shelf in your small bathroom. You can then take advantage of the extra counter space to place various items that are only needed at the moment. When you’re done with it, the shelf can be easily folded and tucked away to maintain a neat-looking bathroom. Utilizing the available space smartly can often mean to focus on areas that you haven’t previously considered. 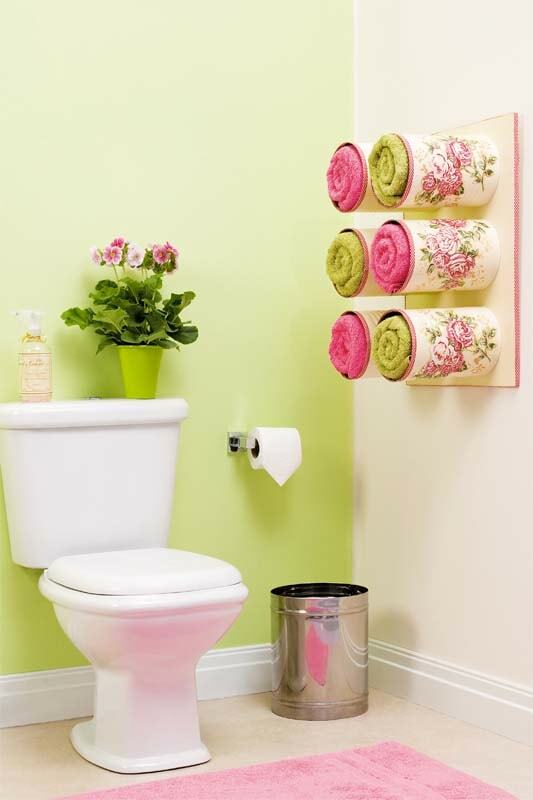 This toilet paper shelf is a nice example given how it provides you with an extra little area where you can place a cell phone or display your favorite little decoration. 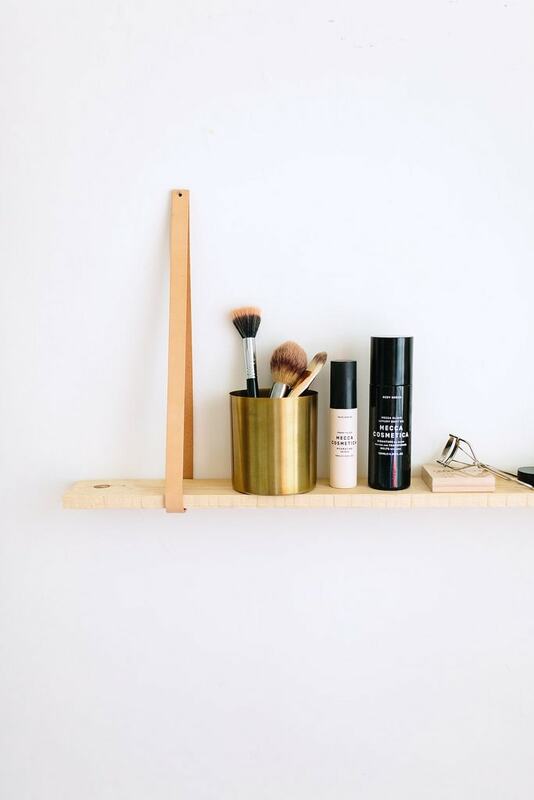 Take a look at the DIY project for this little shelf if you’re interested. In case you were planning to customize your vanity, here’s an interesting idea to try for a small bathroom. By extending the sink vanity closer to the bathtub, you will be able to create some extra shelf space. Maybe it won’t be enough to place bulky items, but a small artwork should fit well. It’s important not to forget about the importance of decorative elements when designing your ideal bathroom. Having built-in shelving in the shower is a game changer when it comes to small bathrooms. The shelves enable you to use the available space in an optimal manner. Place all those body washes and accessories to be used more conveniently. Keep in mind the design of your shower when planning for the shelves to achieve a similar visual effect as this uncluttered look shown here. Some of the smartest storage ideas are those that can resolve multiple issues at once. 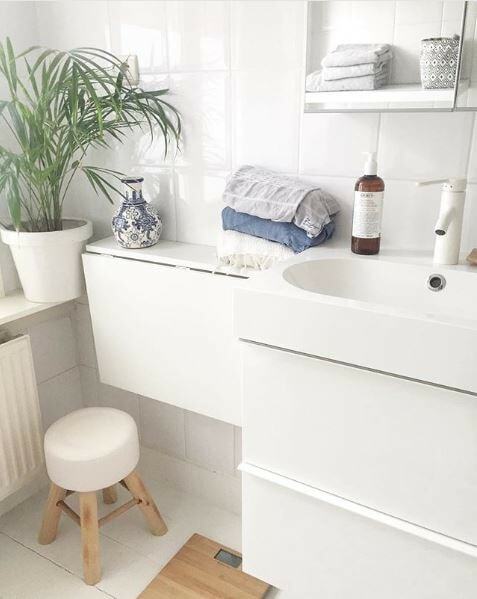 The radiator cover in this small bathroom doesn’t just act as a shelf to store items, it’s also useful to keep the ugly look of the old radiator out of sight. This is a great idea to try if you wish to reclaim some space in the bathroom while maintaining a clean look overall. 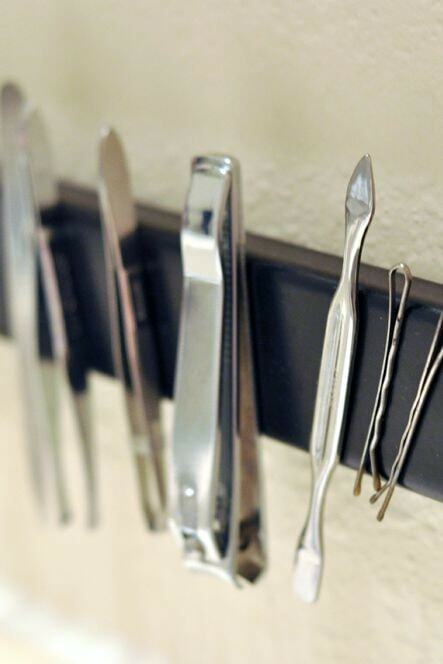 Instead of throwing small metallic accessories into a cluttered pile, why not add magnetic strips in the bathroom to store all of your bobby pins and tweezers in an easy-to-reach spot? Many ideas focus on storing bulky items, but it can be difficult to handle smaller objects as well. It’s no secret that lots of bathroom supplies aren’t very pretty to look at. 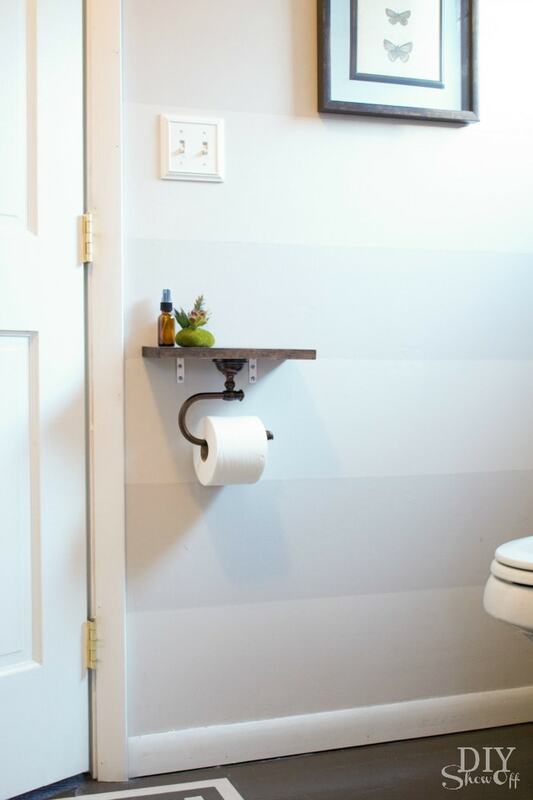 Ordinary shelves may not be ideal if you try to avoid displaying toilet paper throughout. 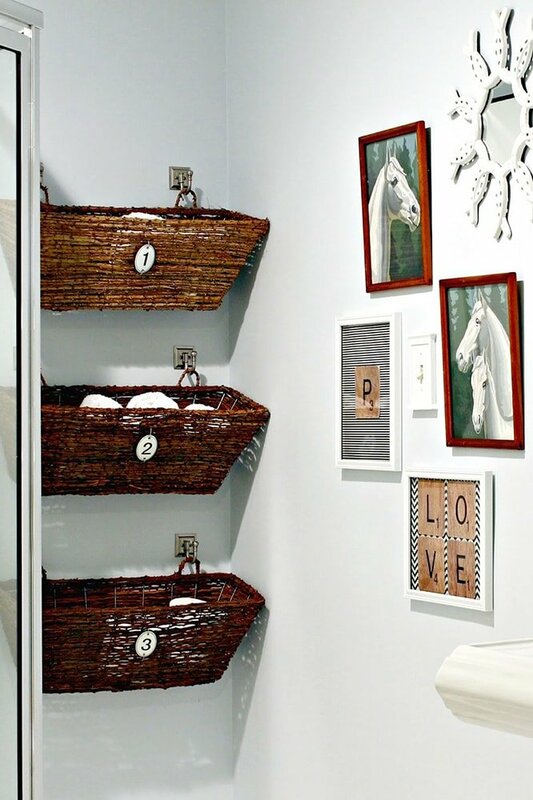 A stylish alternative is to use wall-mounted baskets. Keep a uniform look and number each basket for efficient organization. The FINTORP system from IKEA offers a great organizational potential for the bathroom. Thanks to the addition of numerous hook-based accessories such as the wire baskets, you will be able to store all the knick-knacks from a small bathroom in a more convenient manner. The flexibility of this organizer allows you to design it according to your particular needs. Building your own custom shelf can often be a better idea instead of running to the store. You can personalize the look and create something much more attractive. This leather hanging shelf is a solid example of that considering its minimalist aesthetic. Only two strips of leather are used to hang the wood shelf in an elegant style. This could be a reliable solution for a small bathroom given the flexibility of the DIY project. 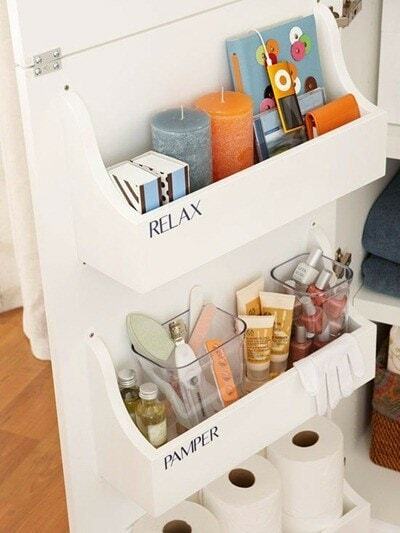 You can fit this shelf with ease in a smaller spot of the bathroom. 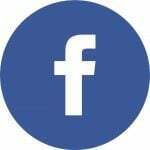 The only thing to keep in mind is that you will need to treat the leather and waterproof it to avoid moisture discoloration. If you want to take advantage of some valuable storage options, it’s recommended to invest in a practical freestanding shelving unit such as this model right here. The best part about this kind of furniture piece is that it doesn’t take too much precious space from the small bathroom. Go for some natural textures like bamboo wood for some relaxing vibes and enhanced durability. Check out this bamboo freestanding shelving unit from Amazon. 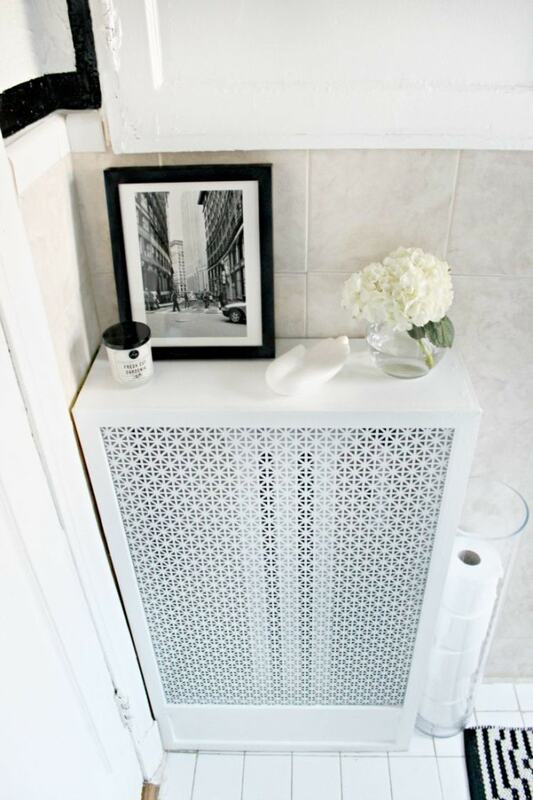 It could be the perfect addition to a small bathroom in need of smart storage. Do you have an old bookshelf and don’t know what to do with it? It can be adapted to fit nicely in a small bathroom so consider repurposing it into a capable storage system. If you manage to integrate it well, you can benefit from plenty of space to add all of your bathroom accessories and supplies in an organized manner. 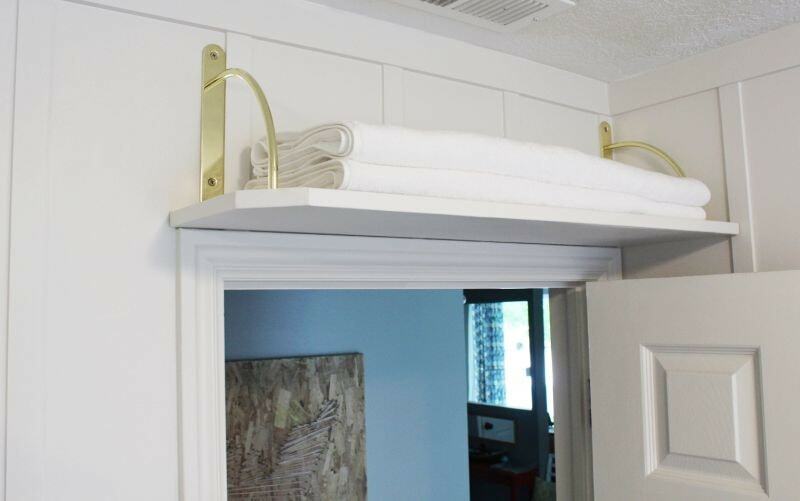 When you plan on creating a dedicated spot for towel storage, you could try getting more creative to save space. Use an old wine rack that’s perfectly suitable for storing rolled towels while maintaining a smaller impact on the square footage of the bathroom. 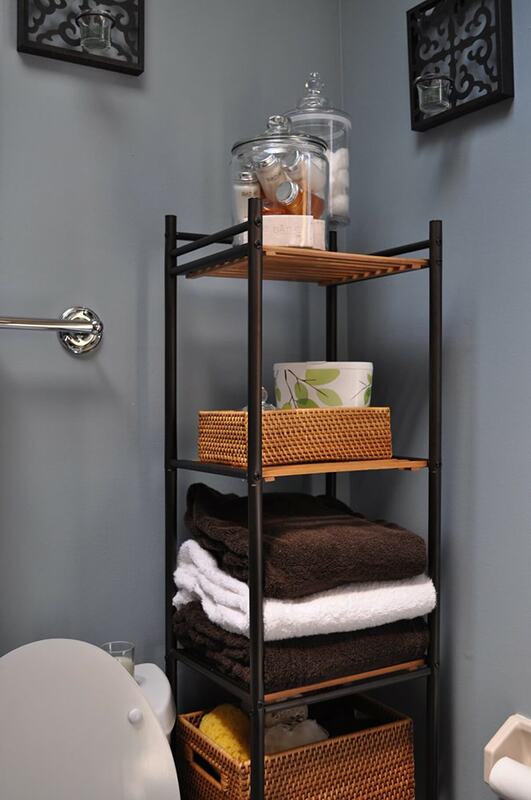 These racks are versatile enough to allow you to store other handy items such as washcloths and hand towels. Here’s a truly unique idea if you’re willing to try a creative DIY project. 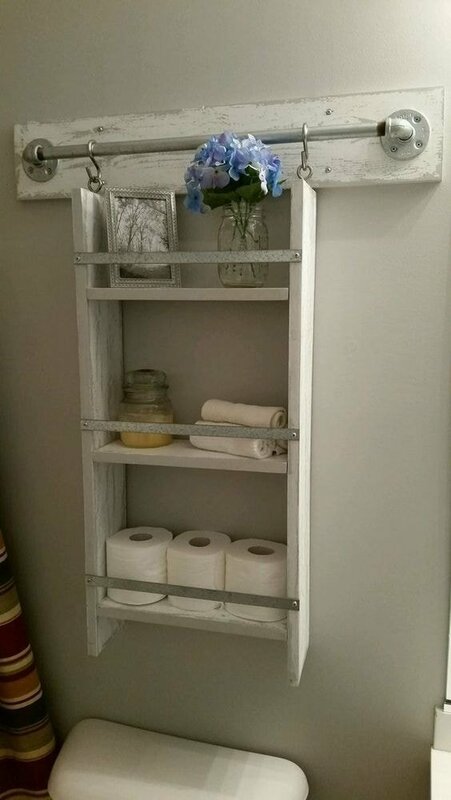 Transform tin cans in convenient shelves for storing towels. The best part is that you can also personalize the tin cans with some colorful designs to add some visual interest. 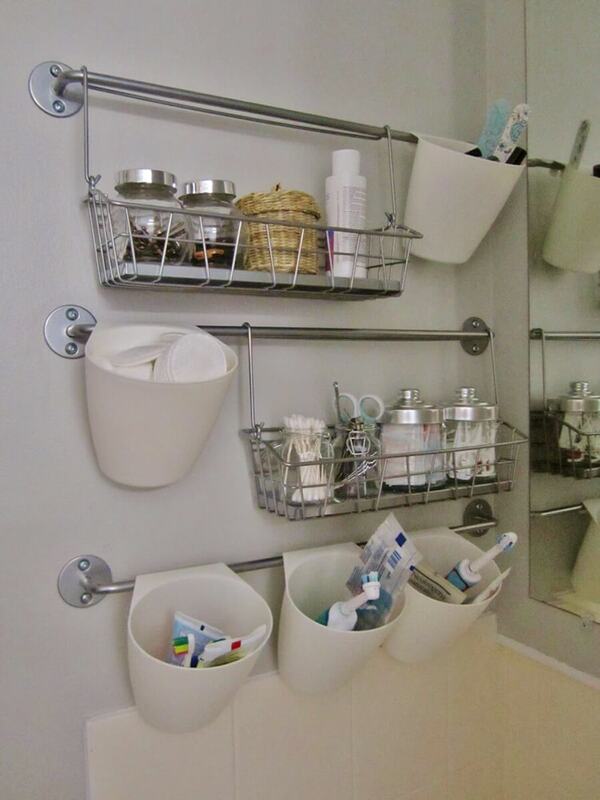 This is a great idea for decorating the bathroom, not just to store things in a more space-efficient way. The idea of building enclosed shelves represents a powerful solution to work around the limitations of a small bathroom. Instead of occupying the wall or other highly visible areas, consider integrating small shelves inside the sink cabinet. This could be an ideal spot to place some storage bins and organize all the items there more efficiently. Check out the DIY guide to try out this idea. If you look around your small bathroom more closely, you might notice some unused space that you can work with. The area below the mirror is a good example as it can often allow you to install a shelf there for extra horizontal space. This stylish bathroom comes with a thin shelf that’s been strategically placed above the wallpaper. It acts as a convenient spot to add a few decorations or important items that you need to have close at hand. One common issue with adding extra shelves is that they’ll stand out too much against the white background of the bathroom. An ingenious solution to this problem is to paint the shelves to blend easily with the color of the walls. The resulting effect isn’t just more visually appealing, but you can also boost the illusion of a large space which is really helpful when you’re dealing with a small bathroom. Choose a sophisticated shade like the dark gray color of this bathroom to create an attractive look that’s not overwhelming.